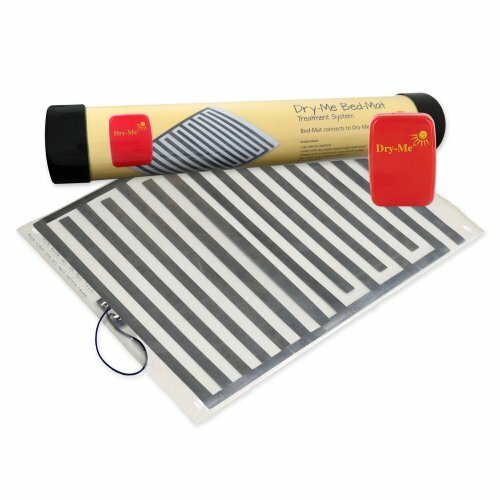 Easy to use and effective against bed wetting, the moisture sensing Dry-Me Bed-Mat Treatment System is specifically designed for children who refuse to wear an alarm. Once placed under the bed sheet or inside a pillow case under the sleeping child, the alarm sounds when the pad's sensor strips detect moisture. The bed pad has dimensions of 21" x 15.5", and connects to the alarm unit via a convenient 7' cord. Clip the red alarm unit to bed sheet or pillow so your child can easily hear it. 3 Alarm options to choose from: 8 loud sounds and vibration, sounds only, or vibration only. To turn the alarm off, simply disconnect and press the reset button. If you have any questions about this product by Dry-Me, contact us by completing and submitting the form below. If you are looking for a specif part number, please include it with your message.